One if not the major cause of Christianity’s demise is the lack of spiritual backbone in either the pulpit or the pew. Now after decades of petitions, church splits, and excommunicated pastors, most churches have settled down with either a hireling or a heretic. Either one cannot speak or act with anointing or conviction. When a leader stands up for truth, most professing Christians will not support him or her. The church that abandoned this pastor has taken a giant leap into apostasy. God’s word is clear–we either oppose and expose wickedness or our silence is as consent. There is no neutral ground in the battle for truth. I am increasingly witnessing and hearing about churches that have given themselves over to heresy or conformity to the world system. It is truly sad given the fact that God gave us enough to be victorious. It is the reason why I seldom preach in churches. I could preach the say way I did when I began preaching, when people wept with repentance in the altar and souls were saved, and the reaction would be entirely different today. They would be stunned, embarrassed, angry, and frozen to the pews in rebellion. They would insist that I am stuck in the past and that they need someone relevant to feed them. 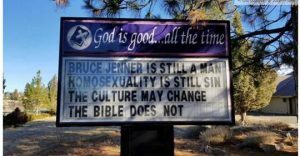 If a church does not even have enough spiritual energy and integrity left to stand with the pastor who makes a bold and truthful statement, it does not have to worry about being spewed. It was spewed out of God’s mouth long ago. That’s how far things have fallen. They are wallowing in the mud and unashamed, even proud of it. There is no church to go to unless you really find a diamond in the desert! Can’t say enough AMEN’S to t his post! Amazing how folks brag about how the will stand for Truth till they suddenly come face to face with having to do it. I truly believe we are going to see MANY fall into compromise because they are not strong enough, willing enough to stand! We are going to have to learn to stand ALONE!